We generally tend to not review live wallpapers, but we’ll make exceptions for noteworthy ones… And we are making an exception for Notification Bubbles WALLPAPER, the reason being that it can do far more than look pretty. Find out what it’s all about in today’s review. Live Wallpapers made their debut with Android 2.1. In a nutshell (and there’s not much more to it than a nutshell): they are animated background images. Ponds without ripples, blades of grass gently swaying in the wind, the starry sky—these wallpapers are standard with Android. ‘That’s all very well, but surely we can do better’ a smart group of developers thought to themselves, and as a result more and more live wallpapers with integration options have been popping up in the market. The Nexus S even comes with such a wallpaper: you can feed germs to ‘Microbes’ by tapping on the display. Cute (kinda), but not particularly useful. What’s cute and useful? Notification Bubbles WALLPAPER of course. 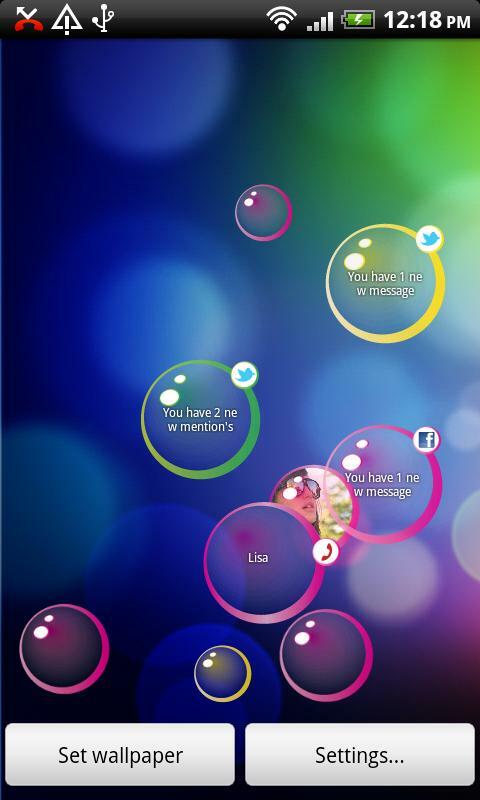 Pretty bubbles float upwards from the bottom of the screen displaying missed calls and SMS text messages. Tap a bubble and it bursts, revealing your list of calls or the SMS. Photos of contacts are also displayed. Facebook, Gmail and Twitter messages all get their own bubbles, too; the bubbles also act as shortcuts to the appropriate applications (provided you have installed the official Facebook / Gmail / Twitter apps). Now, you might be thinking ‘Yes, but the Android notification bar can do all of the above just as well’. True, but does it look as pretty? Besides, a lot of users tend to mask the notification bar out (LauncherPRO is one of the apps that makes this possible). Press on the screen or hit the menu button and ‘Background’ in order to see the wallpaper. You can pretty much design the bubbles yourself: choose how many bubbles should float across the display, pick a sound for when they burst or switch the sound off completely as well as select whether messages should be displayed in the first place. Everything always boils down to personal preferences, but I for one find that Notification Bubbles WALLPAPER is a useful addition to my homescreen. On the other hand, users who display the notification bar might not be as chuffed about the app as I am, which is why we’re awarding Notification Bubbles WALLPAPER three stars in this category. Controls? In this case all you do is tap on the bubbles, what could be easier or simpler than that? The menu is setup logically making it easy to navigate through the options. It goes without saying that Notification Bubbles WALLPAPER is very nice to look at. Notification Bubbles WALLPAPER runs smoothly on the Nexus S, even with 15 bubbles floating around. Switching homescreen is almost completely lag-free. On occasion the animation seems slightly less smooth, but the same can be said for standard live wallpapers. Notification Bubbles WALLPAPER is available for free from the Android Market. A bubble draws your attention to the pay-for version, but if you burst it once it won’t reappear. For EUR0,80 you get more colours and a tool that shows how many bubbles have been burst thus far. I can live without either feature. Nice find, I like the fact that you set it to only show bubbles when there is a notification (as against the other ones that are fully animated and include notifications) ... Shouldn't use as much power. Looks good. I like it when I can edit wallpapers. I'm downloading it atm. Thanks.